Before learning how best to manage fall leaves, it’s important to understand the basic biology behind how they impact and affect the turf and soil. Trees, shrubs, plants and flowers all extract nutrients from the soil in which they reside, nitrogen and phosphorous being the two most vital. Similarly to how we use food for energy, trees and plants use soil. As these nutrients are absorbed, it’s imperative that they’re replenished. This is why most commercial properties use commercial fertilizers, mulches and manure. Soil reclaims nutrients from other organic matter. What you may not know, however, is that autumn leaves are one of the best sources of organic matter. Tree roots burrow deep into lower layers of soil, drawing trace minerals (calcium, magnesium, potassium and phosphorus) from the earth. These minerals are deposited in the leaves of the trees and are replenished in the soil once the leaves fall. Leaves are carbon based and add balance to the soil. They act as food for worms and essential microbes. Worms help aerate the soil while leaves retain moisture for spring plants. In fact, most leaves contain more minerals than other organic fertilizers. With all of the benefits leaves provide the ground beneath them, why do we need to rake and collect them at all? As beneficial as leaves are to the soil, they can be more damaging if they’re not collected and used properly. Simply allowing leaves to fall and collect on the ground will essentially create a barrier between the leaves and the soil, which traps moisture within the layers of fallen leaves, blocks the sun, fosters an environment for fungus and mold to grow and prevents air and moisture from reaching the soil. Fallen leaves will be picked up multiple times during the autumn season (October–November) with the last pick up completed right before the first snowfall. For sites that have densely planted trees and/or large, mature trees, leaf removal is a must for maintaining a clean, orderly appearance. When leaves begin dropping in fall, mowing crews take extra time to cut them into small, fine pieces during routine mowing visits. 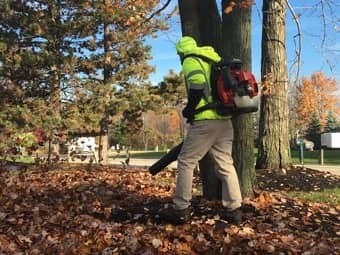 When leaves start falling in heavy concentrations, they’re gathered together by commercial blowers and either carried off into an on-site wooded area (to be used as natural mulch), collected by means of a vacuum and removed or brought to local composting sites. A final leaf removal may occur in the late fall to ensure your property looks clean and orderly over the winter months. Note: Some species of trees don’t drop all their leaves in the fall; they gradually lose them over the winter months. A select few trees continue losing leaves into the spring when their new leaves begin budding. Therefore, please be aware that some leaves can be present throughout the winter season. For more information on how to best manage your fall leaves, contact one of our knowledgeable Account Managers today!